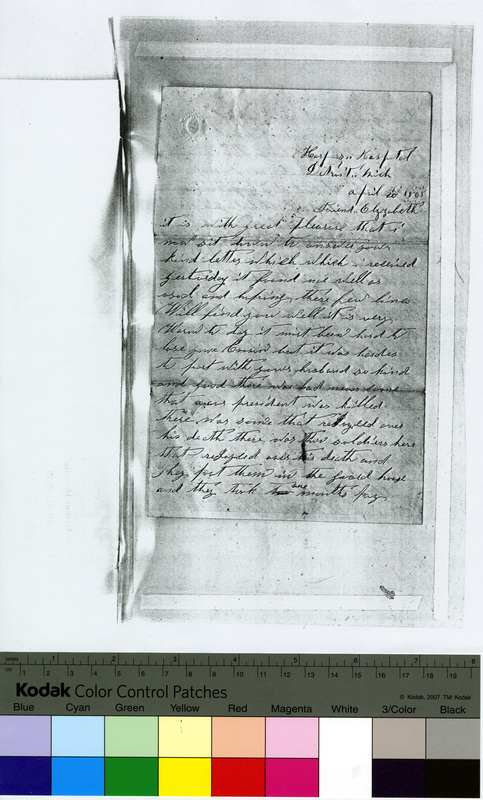 Photocopy of a handwritten, unsigned letter from a Union soldier in Harper Hospital, Detroit, Michigan, April 20, 1865 to Friend Elizabeth [perhaps the widow Lib (Mrs. Levi) Smith]. The writer enjoyed her letter and hopes she is well. He is sympathetic over the loss of both her cousin and husband. The writer may have served or been hospitalized with both of these men. He heard from home that the president was killed. He notes that some people rejoiced over the news and two soldiers were fined a month's pay each and jailed because they rejoiced. He hopes the war will soon end as drafting and enlisting has stopped. He wants out of the hospital, either to return home or to his unit. He notes several who are ill. He writes that both his father and brother are in service. He concludes the letter because his hand shakes so he cannot hold his pen and asks her to write soon. The letter is part of the Levi Smith Family Papers, 1851, 1903. Levi Smith (1832-March 10, 1865) was the first husband of Elizabeth "Lib". He moved to Elba Township (Lapeer County, Mich.) from Ohio. Together they had a daughter. Levi enlisted in Company I, First Michigan Engineers and Mechanics on December 23, 1862 as an artificer. He died of disease in Detroit on March 10, 1865. She then married another man, also with the surname of Smith, and had three more children. that our president was killed. all can go home to our friends,. sick. he has been sick about a week. Trembles so that i can't hold my pen still.